You would be hard-pressed to find a more fitting way to celebrate October 30, known as Devil’s Day in some parts of the country, than spending it at the Falvey marathon reading of Dante’s Divine Comedy. Dante’s epic poem provides an allegorical journey of himself, as a pilgrim, traveling through hell, purgatory and heaven, where he finally meets God face to face. All Villanova University students, staff and faculty are invited to come and read one of the Cantos from the Inferno, Purgatorio or Paradiso, beginning at 10 a.m. in the library first floor lounge. You may read in either English or Italian! This year’s Villanova University community marathon reading focuses on all things Italian. Sponsored by the Italian Club, the Department of Romance Languages and Literatures, the Villanova Center for Liberal Education (VCLE), the Office for Mission and Ministry, the Department of Humanities, the Classical Studies program and the Library, the marathon reading is the brainchild of Romance Languages Assistant Professor Diane Biunno, PhD, and Special Collections and Digital Library Coordinator Michael Foight. University President the Rev. Peter M. Donohue, OSA, PhD, ’75 A&S, will begin the event, reading the first of the Cantos at 10 a.m. in the first floor lounge. Dr. Biunno and Foight, along with Marylu Hill, PhD, VCLE director, anticipate that the reading will continue until midnight. Depending what time of day you stop by, you will be regaled with a colazione, pranzo or cena of Italian-themed delizioso treats! Asked what relevance a fourteenth-century work like the Divine Comedy has for 21st century readers, Foight replied with a laundry list of reasons, notably the meaningful parallels between this work and most students’ journey through their college years. Like Dante, students are faced and regularly tempted with the Seven Deadly Sins, as they seek to reconcile their behavior with their morality and values, especially at a Catholic university. And of particular congruity to Villanova University students is the special guest appearance of the University’s patron, Saint Augustine, in Canto XXXii of the Paradiso. Foight also mentions the prolific use of Dante’s allegories and imagery in modern, adaptive works, and Dante’s stylistic device of casting himself in his own poem, also seen in contemporary literature. The Special Collections team, including Digital and Special Collections Curatorial Assistant Laura Bang, has planned a corresponding physical exhibit that will feature a plethora of these modern adaptations for the first floor exhibit cases, including recent films, graphic novels and games. 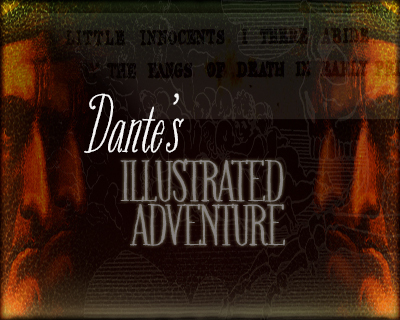 The event coincides with the launch of an online exhibit of Dante materials from Falvey Special Collections prepared by Dr. Biunno, billed as an “illustrated adventure” through the epic, with scans of etchings and prints by Dore, Botticelli and others. This exhibit will go live the morning of Oct. 30. Dr. Biunno served as a Digital Library intern this summer and is currently enrolled in Drexel University’s Master of Science in Library and Information Science program. She teaches Italian courses here at Villanova University. Her students will read a portion of the Cantos in Italian.